Is Your Androgel Medication Too Expensive? Are you looking for a place to get your Androgel (Testosterone) medication at an affordable price? Prescription Hope offers the top medications prescribed on a national level all for the set cost of $50 per month for each medication! Prescription Hope is a nationally recognized prescription medication access program, headquartered in Columbus, Ohio. We access over 1,500 FDA-approved prescription medications for $50 per month for each medication. This covers 100% of the medication cost no matter the retail price. Prescription Hope is NOT a prescription discount card or an insurance plan. If your Androgel cost is too much, Prescription Hope can help. Do I Qualify To Get My Androgel Medication Through Prescription Hope? Prescription Hope works for thousands of Americans every month, obtaining prescription medications on their behalf for the set price of $50.00 per month per medication. Qualification into Prescription Hope is income based. Individuals earning up to or around $30,000 per year, households with a combined income of up to or around $50,000 per year, and families earning up to $100,000 per year may qualify for Prescription Hope. If our advocates cannot obtain Androgel for you, we will never charge a fee for that medication. coming on a regular schedule. Through our program, Americans save thousands every year from the retail cost of their prescription medications through Prescription Hope. Is Prescription Hope an Androgel Coupon Or Insurance Plan? Prescription Hope is not an Androgel coupon or insurance policy. This is also not an Androgel generic. Instead, Prescription Hope obtains your brand-name medicines directly from the U.S. based pharmaceutical manufacturers and their pharmacy. Although Prescription Hope is not an Androgel coupon, individuals looking for an Androgel coupon can find more savings through Prescription Hope! Furthermore, there are no applications fees or hidden charges for Prescription Hope. In the event Prescription Hope cannot obtain a prescription medication, there will never be a fee for that medication. Could Prescription Hope Obtain My Other Prescription Medications As Well? For the set price of $50.00 per month per medication, Prescription Hope can obtain any of your prescription medications on our medication list. The top-100 prescribed medications in the United States are accessible on our medication list. Although we do not cover generic medication, if you are prescribed a generic you cannot afford we encourage you to still apply as we may be able to get the brand name equivalent. If we cannot help you obtain a medication, we will not charge you for that prescription medication. Apply with Prescription Hope now, and start living a better life with affordable prescription medication. Can I still Use Prescription Hope For Androgel If I Have Insurance Coverage? Prescription Hope can work with many insurance plans as a value-added program, filling the coverage gap individuals may fall into. Because our program is not an insurance plan, there are no copays, deductibles, or medication tiers for you affordable prescription medications. When you use Prescription Hope, your total will never cost more than $50.00 per month per medication. As a trusted partner for insurance organizations, Prescription Hope can help insured individuals maintain their policies by obtaining their prescription medications for the set price of $50.00 per month per medication. Contact us today to learn more about how we help insured patients obtain prescription medications. Testosterone is a medication and naturally occurring steroid hormone. It is used to treat male hypogonadism and certain types of breast cancer. Those prescribed Androgel may be able to access prescription medication with the help of Prescription Hope. 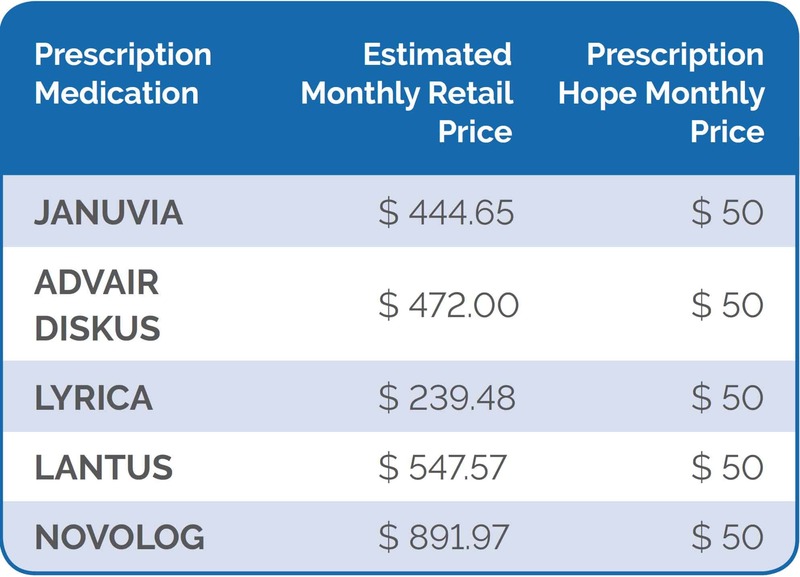 As the nation’s fastest-growing pharmacy program, Prescription Hope can obtain over 1,500 FDA-approved prescription medications from over 180 U.S. based pharmaceutical manufacturers for the set price of $50.00 per month per medication. Apply today, and begin obtaining your prescription medications at an affordable price through Prescription Hope.